Author(s): Christel Herold-Mende, Andreas Mock. Experimentelle Neurochirurgie, Neurochirurgische Universitätsklinik, INF 400, 69120 Heidelberg, Germany. 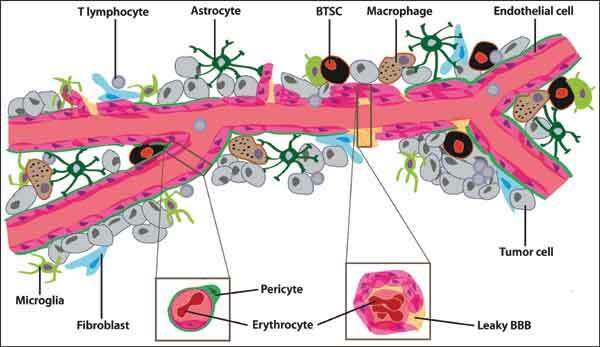 There is a lot of experimental evidence that brain tumors might be sustained by a subpopulation of immature cells, so-called brain tumor stem cells (BTSCs), which do not only drive tumor formation but are highly resistant to conventional therapies. Recent findings suggest a critical role of the molecular and cellular tumor microenvironment in which these cells reside for the maintenance of stem cell properties and therapy resistance. However, detection of different BTSC phenotypes even in the same patient tumor and the observation of a marked plasticity due to instability of the BTSC phenotype caused by the environmental niche have led to a controversial discussion on the validity of the cancer stem cell concept. What complicates the situation even more is that there are different types of niches and little is known about the interplay of the niche components with one another and with different types of BTSCs in the context of stem cell maintenance. In this article we review our current knowledge on different BTSC phenotypes and the cellular components and physiology of the niche in which these cells reside. In addition, we will summarize the molecular and functional interaction of niche cells and niche conditions and how this impacts on BTSC maintenance. Keywords: Brain tumor stem cells, glioblastoma, hypoxia, maintenance, niche. Affiliation:Experimentelle Neurochirurgie, Neurochirurgische Universitätsklinik, INF 400, 69120 Heidelberg, Germany. Keywords:Brain tumor stem cells, glioblastoma, hypoxia, maintenance, niche. Abstract:There is a lot of experimental evidence that brain tumors might be sustained by a subpopulation of immature cells, so-called brain tumor stem cells (BTSCs), which do not only drive tumor formation but are highly resistant to conventional therapies. Recent findings suggest a critical role of the molecular and cellular tumor microenvironment in which these cells reside for the maintenance of stem cell properties and therapy resistance. However, detection of different BTSC phenotypes even in the same patient tumor and the observation of a marked plasticity due to instability of the BTSC phenotype caused by the environmental niche have led to a controversial discussion on the validity of the cancer stem cell concept. What complicates the situation even more is that there are different types of niches and little is known about the interplay of the niche components with one another and with different types of BTSCs in the context of stem cell maintenance. In this article we review our current knowledge on different BTSC phenotypes and the cellular components and physiology of the niche in which these cells reside. In addition, we will summarize the molecular and functional interaction of niche cells and niche conditions and how this impacts on BTSC maintenance.